3D Printing Helps Visually Impaired "See"
We've blogged before about firms that are using 3D printing to help the visually impaired "see." Innovative individuals and businesses have found unique ways to enhance the aesthetic, educational, and medical experiences of people with different levels of blindness. In Helsinki, designers are 3D printing replicas of famous works of art so that they can be touched and experienced in a way like never before; objects can now be handled by visually impaired students so as to better understand concepts in their education. A doctor in New Zealand has applied this technology to create an affordable medical device that can help examine patients’ eyesight and diagnose conditions that can be treated and prevented. In this one field of medicine we in turn can see a global effort to make lives better through 3D printing and its versatile array of applications. Could 3D Scanning and Printing Improve Splint Production and Fit? This week, I graduated from a soft cast to a hand splint, custom made from low-temperature thermoplastic and Velcro. The process was an interesting mix of art and science. My Occupational Therapist, who specializes in hand injuries, regularly creates them "while you wait." The procedure began with a gross sizing using a paper pattern placed against my arm to determine how much thermoplastic material would be needed. After the two sheets were cut down, each was heated in a hot water bath and then carefully molded against my arm to obtain a form fit - a snug, protective shield whose edges roll away from the skin to prevent chafing. Later the two splints were joined by a series of strategically placed Velcro strips. Unfortunately, I encountered pinch points which prompted a return visit this morning... alas, as I type this post, I suspect there will be more tweaking needed. So I find myself debating whether the fitting process could be improved using a 3D scanner and printer. Theoretically, a doctor's staff could quickly scan the patient's hand in the office to create a model that could then be used to make the splints. The final fitting would then be completed during the first OT appointment, allowing the patient to begin therapy during the initial visit instead. But would the additive manufacturing approach be much more accurate than the current in-office process? I suspect it might be more expensive (but I won't know until I get the bill) and since the splints are only worn (hopefully) for about four weeks, insurance companies might not approve. But given how tender the injured body part can be, anything that minimizes the amount of handling required during the fitting would be welcomed. 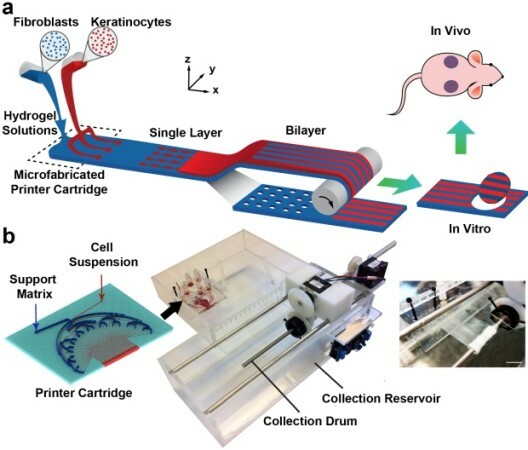 Researchers at the University of Toronto have built the PrintAlive Bioprinter which prints skin grafts derived from a host patient's own skin cells. These cells, used as the material "ink" needed to produce the build, are deposited into strips that contain fewer cells than are typical in the "full continuous sheets" commonly used. The benefits of this approach are two-fold: it is faster than using cultured skin cells which take two weeks or more to grow enough to be grafted. And when skin damage runs deeper than the epidermis, this technique's bioprint pattern allows multiple layers to be applied and still survive. The team includes Masters students Arianna Mcallister and Lian Lend, PhD student Boyang Zhang and University of Toronto Associate Professor of Mechanical and Industrial Engineering Axel Guenther. To date, their research has been confined to mice, but the researchers reportthe technology has worked to heal "severe wounds" and they expect human trials may be possible in two to three years. Further south, a research team at the University of Massachusetts Medical school, led by Dr. Jie Song, is using a MakerBot Replicator to print a latticed scaffold implant it hopes will someday promote healing in damaged bones and tissues. Unlike the traditional filaments used in FDM printers, this 3D printer is fed a combination of "plastic and the therapeutic stem cells or proteins that a patient needs to heal, and the flexible scaffold that emerges could become a kind of patch for use by surgeons." The lab is also investigating a similar approach to "regenerate the periosteum, a tissue that covers bone."